Brooklyn closed as a 3.5-point underdog Tuesday in Sacramento with the Kings' playoff hopes all but gone, and an incredible comeback has Sacramento on the brink of missing the playoffs for the 13th straight season. Brooklyn closed as a 3.5-point underdog Tuesday in Sacramento with the Kings' playoff hopes all but gone, and an incredible comeback has Sacramento on the brink of missing the playoffs for the 13th straight season, the longest active streak in the league. Life in the NBA can be unfair sometimes. If the Kings (34-36) were in the Eastern Conference, they'd be tied with the Heat for the final playoff spot. The Nets (37-36) are seventh iin the East. But after becoming the fourth team in the shot-clock era [to give up a 25-point, fourth-quarter lead](https://twitter.com/ESPNStatsInfo/status/1108225214658342913?ref_src=twsrc%5Egoogle%7Ctwcamp%5Eserp%7Ctwgr%5Etweet), they're now [seven games behind the eighth-place Clippers](https://www.thescore.com/nba/standings) with 12 to play. The spread wasn't decided in the final seconds, which is about the only saving grace for Sacramento bettors. Oh, and by the way, the Kings' 41-27-2 record against the spread is still second best in the league behind the Bucks (42-26-3), so if you've been riding them all season, I guess you can't really be that mad? Actually, scratch that, you can be very mad. 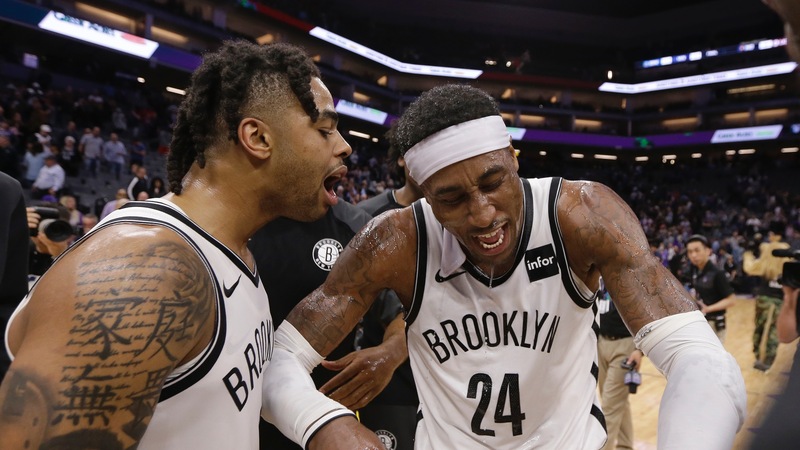 Anyway, let's get to what happened... __MORE:__ [Our complete NCAA Tournament coverage](https://www.betchicago.com/ncaa-basketball-betting) ## Nets bad beat vs. Kings The Kings led by as many as 28 in the third quarter and went into the fourth up 103-78. D'Angelo Russell had 17 points at that point, and came back into the game to start the fourth after getting a blow to end the third. That's when he and Rondae Hollis-Jefferson went nuts. Hollis-Jefferson scored the first seven points of the quarter, and after a Buddy Hield dunk, he and Russell had all but three of the points in a 19-4 run to make it a five-point game with 4:43 left. Still not covering but with all the momentum, Russell scored the Nets' next 16 points to pull them within one and Jared Dudley hit a 3-pointer with 1:11 left to give them their first lead (121-119) since it was 15-13 in the first quarter. Sacramento's last lead of more than three points was before Russell's 3-pointer that made it 116-114 Kings with 2:08 to play. Overtime looked like a possibility when Marvin Bagley III turned it over with 5.9 seconds left and then game tied, but then Hollis-Jefferson did this... <a href="https://youtu.be/DDXxBNlA3Y8?t=426" class="embedly-card" data-card-width="100%" data-card-controls="0">Embedded content: https://youtu.be/DDXxBNlA3Y8?t=426</a> The Nets, who were 0-178 when trailing by at least 25 points at any point of a game in the last 20 seasons (according to ESPN), were +155 on the moneyline. Russell finished with a career-high 44 points, including 27 in the fourth and Hollis Jefferson had 14 off the bench (all but two in the fourth). Brooklyn, which had lost the first three games of its season-high seven-game road trip, outscored the Kings 45-18 in the quarter. __PLAY:__ Our free [Daily NBA Pick 5 game](https://betchicago.chalkline.com/games/nba-pick-5). Pick five select NBA games ATS to win a BetChicago prize pack.